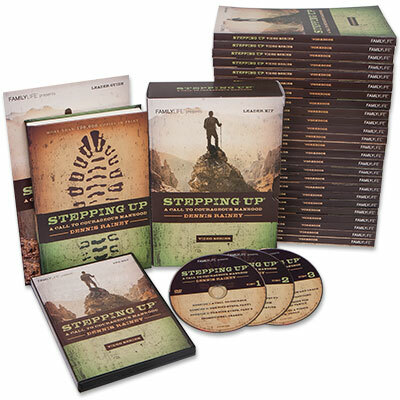 Take 25 guys through the Stepping Up Video Series and save 25%. Have a smaller group? Check out our Small Starter Pack for groups of 5! The large starter pack includes the leader kit and 25 additional workbooks. Based on his book Stepping Up, Dennis Rainey, along with Matt Chandler, Bill Bennett, Tony Dungy, Robert Lewis, Voddie Baucham, Stu Weber, and others unpack what biblical manhood looks like and what it means to be a godly, courageous man in today's world. Through engaging stories, expert teaching, humorous vignettes, man-on-the-street interviews, and personal insights, these men’s ministry leaders call every man to become courageous leaders in their own lives, marriages, churches, and communities. Designed for 10 sessions of about 90 minutes each, video sessions average 25 to 35 minutes.